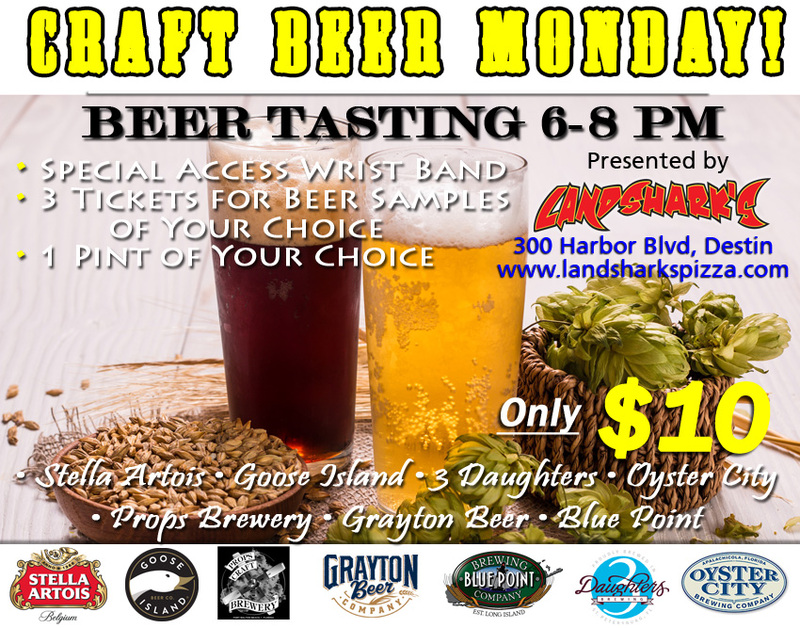 / Best Burger Deal in Destin FL / Burger & Brew Monday PACKERS vs LIONS YOU SCORE, WE POUR – $9.99 Grilled Basket & CRAFT BEER TASTING@6PM! 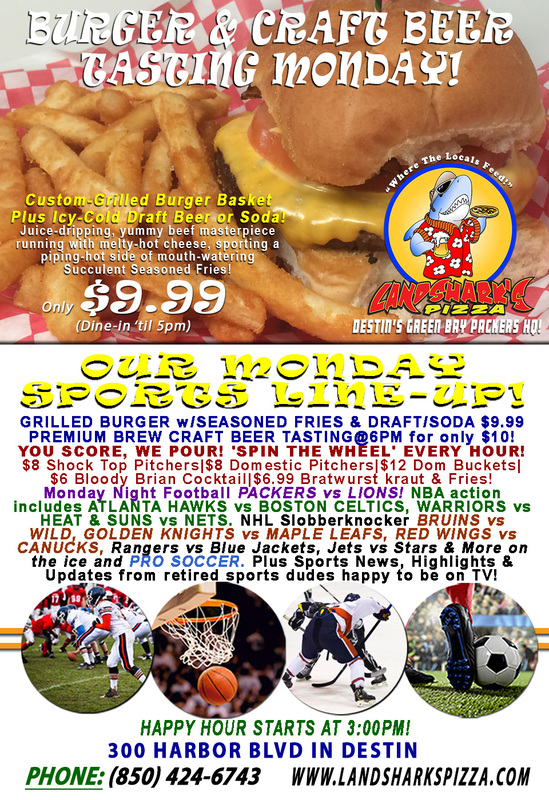 Burger & Brew Monday PACKERS vs LIONS YOU SCORE, WE POUR – $9.99 Grilled Basket & CRAFT BEER TASTING@6PM! Make Monday in Destin a reason to smile with our Landshark’s Pizza Co. custom-built hot, juicy, cheesy, melty feast of a burger accompanied by succulent seasoned fries & your choice of icy-cold Draft Beer or a flavorful Soft Drink for only $9.99 (’til 5PM)! 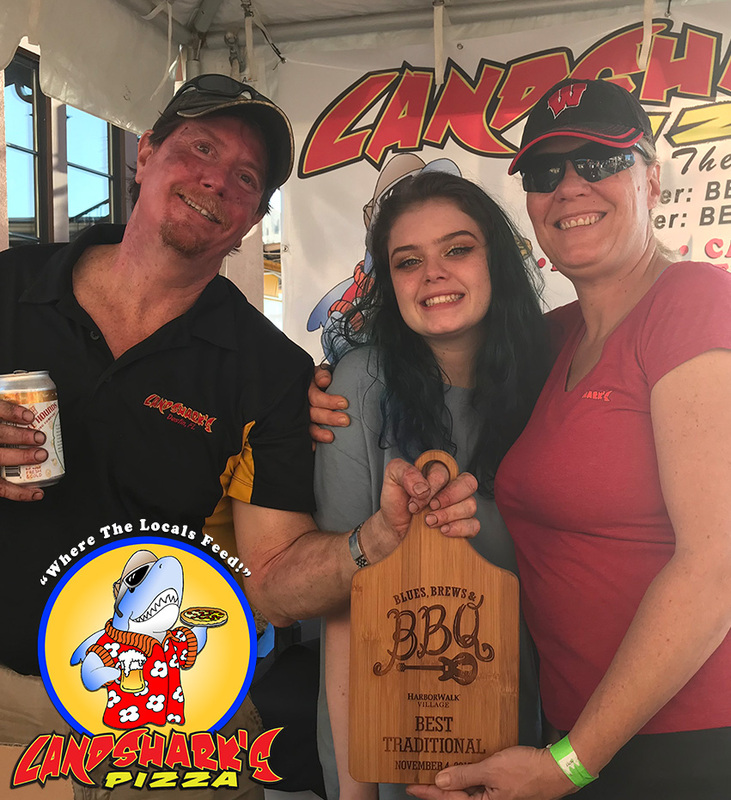 Coming off a WONDERFUL weekend in which Landshark’s won Best Traditional BBQ@BLUES, BREWS & BBQ Festival, we’re ready to kick the work week off right with a sizzling-hot GRILLED BURGER & ice-cold BREWSKIES and a PREMIUM CRAFT BEER TASTING to go with some great game-time specials! YOU SCORE, WE POUR! Wear your PACKERS or LIONS jersey and win a FREE BEER POUR with every touchdown! ‘SPIN THE WHEEL’ DEALS Every Hour! $8 Shock Top Pitchers|$8 Domestic Pitchers|$12 Domestic Buckets|$6 Bloody Brian Cocktail|$6.99 Bratwurst Sauerkraut & Seasoned Fries! HOT SPORTS ON OUR ARMY OF BIG SCREENS – Monday Night Football GREEN BAY PACKERS vs DETROIT LIONS! NHL Hockey BRUINS vs WILD, GOLDEN KNIGHTS vs MAPLE LEAFS, RED WINGS vs CANUCKS, Rangers vs Blue Jackets, Jets vs Stars & More on the ice! NBA Hoops includes ATLANTA HAWKS vs BOSTON CELTICS, WARRIORS vs HEAT & SUNS vs NETS plus PRO SOCCER coverage & plenty other Sports Broadcasts, Updates, Analysis, and Commentary! College Football This Week: (Tues)Bowling Green vs Buffalo|(Wed)Western Mich vs Kent St.|(Thurs)Includes Pittsburgh vs No. Carolina|(Fri)#12 Washington vs #21 Stanford. PGA This Week: (Thurs) OHL Classic at Mayakoba@El Camaleon. Pro Football This Week: (Thurs) Seahawks vs Cardinals. NASCAR in Phoenix This Week: (Fri) Camping World Trucks Lucas Oil 150|(Sat) Ticket Galaxy 200|(Sun) CAN-AM 500@Phoenix Raceway. 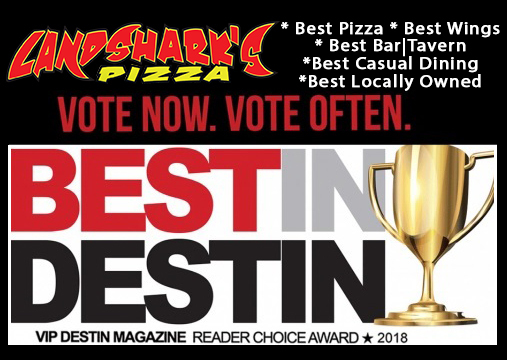 LANDSHARK’S PIZZA WOULD LOVE TO HAVE YOUR VOTE FOR ‘BEST IN DESTIN 2018’! 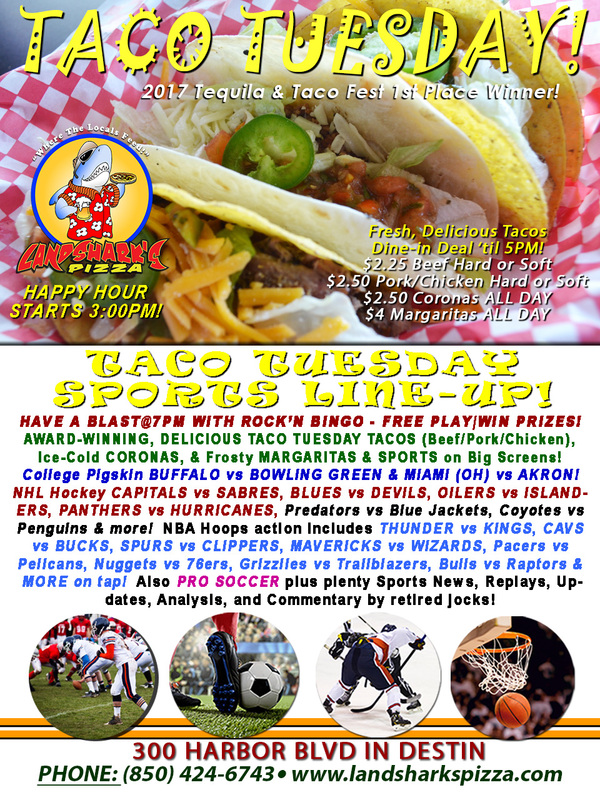 Previous Post: « Landshark’s NASCAR AAA TEXAS 500 Action Sunday|BRONCOS vs EAGLES ‘You Score, We Pour’ & More Specials!